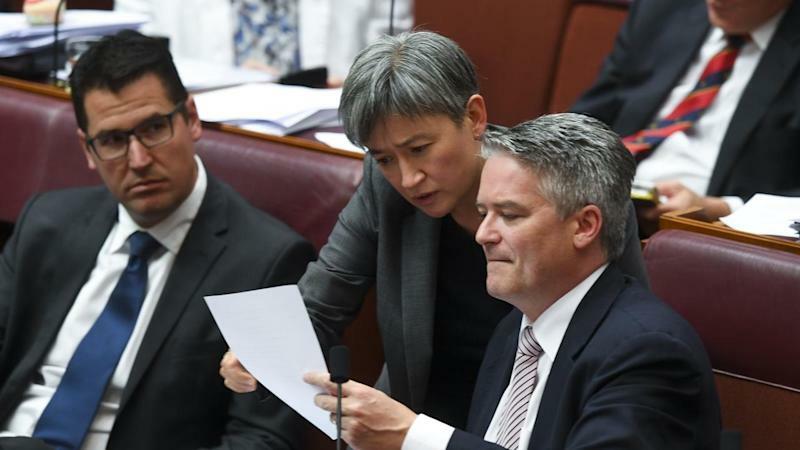 Penny Wong's gravitas and determination - and a strategically deployed arched eyebrow - has won her admiration across politics. Now she has been lauded as offering Australia's best political leadership, in an annual non-partisan prize linked to the University of Melbourne. The Labor Senate leader was named the McKinnon Political Leader of the Year on Wednesday for her leadership and advocacy in promoting a more tolerant and inclusive Australia, and for shaping the nation's foreign policy dialogue. She said current times were testing ones for democracy, with many Australians losing faith in institutions and their representatives. "Around the world, democratic principles are being challenged. But it is democracy which enables the betterment of our community and the protection of rights," Senator Wong said upon accepting the award. "So we must step forward to defend it, in principle and in action, at home and internationally." On Tuesday, she called for politicians across the board to step up and show leadership on the values of inclusion, acceptance and respect after the horrific shootings in New Zealand mosques, saying it was a job for all of us. The prize was set up by the University of Melbourne in partnership with the Mckinnon foundation established by businessman Grant Rule and his wife Sophie Oh to foster positive social change. Senator Wong was chosen by a panel that included former prime ministers John Howard and Julia Gillard and business, political, education and sporting leaders. Ms Gillard, who appointed Senator Wong to her cabinet, said her ability to bring people together and guide the nation through complex debates, including showing how Australia as a nation should react to racist statements, had made her the perfect recipient of the prize. Greens senator Jordon Steele-John was named the McKinnon Emerging Political Leader of the Year. He was a driving force behind the push to establish a royal commission into the treatment of people with a disability, asked state leaders for support and even went so far as to heckle Prime Minister Scott Morrison from the guest seats in the lower house over the issue. Ms Gillard said his campaigning on the matter was very impressive. Senator Steele-John said he accepted the award as a proud disabled man and youth rights activist and that it was time to acknowledge that Australia's political system was made up largely of people whose lives and experiences look nothing like those of the community they are supposed to serve.